Source: The Innovation Imperative: The Future of Drug Development, The Economist Intelligence Unit, 2018. PAREXEL has not only been practicing a patient-centric approach for years, but we are also an innovator in this area. To this end, we have established our Patient Innovation Center, that includes a dedicated team striving to build on PAREXEL’s mission to reduce patient burden and simplify their journey to new treatments. Our services incorporate patient input into all aspects of clinical development: clinical trial design, recruitment, and execution. 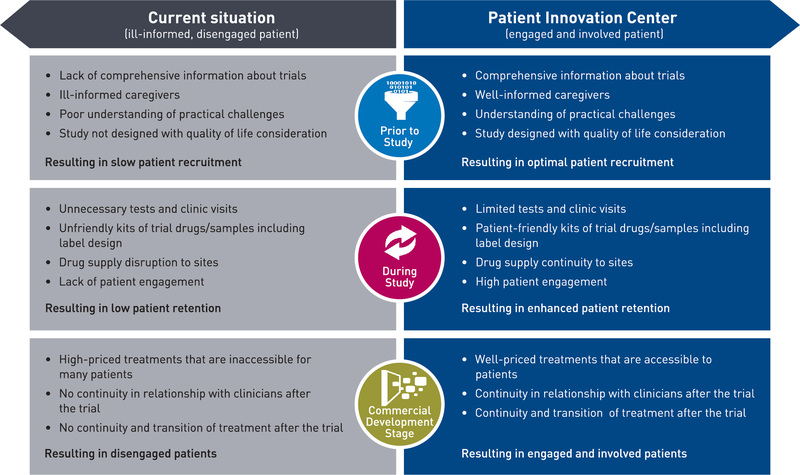 Through our Patient Innovation Center we are constantly looking for new ways to empower patients to become active participants in the study planning process. We aim to simplify the patient to journey to enhance satisfaction and compliance with study requirements. We use our innovative practices in our protocol design process to identify and address potential practical challenges to study participation. We use a combination of web listening, patient, caregiver and site staff input, to get a clear picture of the patient burdens and help sponsors positively impact study recruitment and retention. We proactively seek opportunities to earlier address the needs of commercial stakeholders and build a better value story. Our regulatory experts incorporate guidance to address agency requirements from a patient-centric perspective. We use the most appropriate virtual trial elements such as online recruitment, eConsent, home nursing, direct-to-patient drug shipments, patient apps and video dosing to reduce patient burden and number of site visits without leaving home. PAREXEL’s Patient Sensor Solution can also be leveraged for continuous data collection through the use of wearables to remotely capture, transmit and store data in a secure platform powered by our clinical cloud computing solution, Perceptive® Cloud. As the patient’s study involvement comes to an end, PAREXEL deploys a closure plan to help patients understand the study outcome and ways to transition them to a post-study treatment plan. Throughout development and beyond, PAREXEL supports the identification, development and communication of evidence to accelerate market access so that patients in need can benefit from innovative new products sooner. Through our Managed Access Programs we also facilitate early access to promising new medicines for patients with unmet needs. 1. The Innovation Imperative: The Future of Drug Development, The Economist Intelligence Unit, 2018. 2. The Innovation Imperative: The Future of Drug Development, The Economist Intelligence Unit, 2018. Visit our dedicated knowledge hub to see our latest articles, case studies, videos about our Patient Innovation Center and PAREXEL's patient-centric approach. Watch our new video to learn how PAREXEL simpilifies the patient journey through our Patient Innovation Center.